It seems there’s a rift in the Republican Party between hard-line TeaPartiers and establishment Republicans. 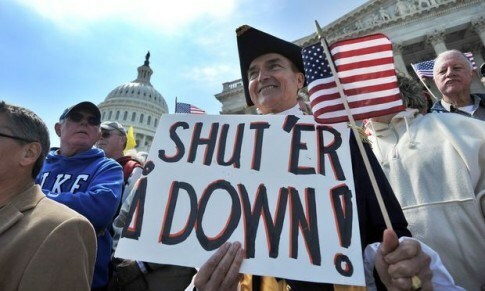 A Teapartier ended Eric Cantor’s dreams of becoming the first Jewish Speaker of the House. But these dreams were thwarted not by the little known populist Dave Brat, but by those behind the scenes, pulling the strings in the GOP: The Heritage Foundation. Cantor was losing favor with Heritage’s think tank, the Cato Institute, whose pockets are very, very deep. Eric Cantor’s willingness to even consider a pathway to citizenship for undocumented immigrants was merely a diversion. Right wing talk radio hosts like Laura Ingraham and Mark Levin helped Heritage destroy Eric Cantor by using populist techniques of personally exposing the lavish lifestyle of the once and future Speaker. Brat told Internet radio host Flint Engelman that the “number one plank” in his campaign is “free markets.” Brat went on to exx plain, “Eric Cantor and the Republican leadership do not know what a free market is at all, and the clearest evidence of that is the financial crisis … When I say free markets, I mean no favoritism to K Street lobbyists.” Banks like Goldman Sachs were not fined for their role in the financial crisis — rather, they were rewarded with bailouts, Brat has Zsaid. The American Conservative Union (ACU) awarded Eric Cantor a 95% rating, and the ACU was the gold standard for measuring Conservatism. 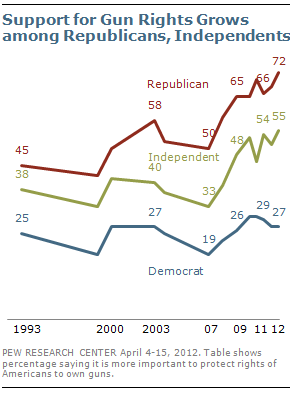 At the same time, Heritage Action For America had Cantor at 53%, because he was not Conservative enough. Media has focused largely on the ACU in the past for predicting election outcomes. But former Senator Jim DeMint did not retire from the U.S. Senate midterm to take a less powerful position at the Heritage Foundation, the group responsible for the government shutdown of 2013. Dave Brat is a new populist brand of Libertarian. In addition to his Ayn Rand-style economics views, he says his religious background informs his views on economics. “I’ve always found it amazing how we have the grand swath of the Judeo-Christian tradition, and we lost moral arguments on the major issue of our day,” he says, referring to fiscal-policy issues. The Cato Institute is largely the reason Dave Brat was able to defeat the establishment Goliath. 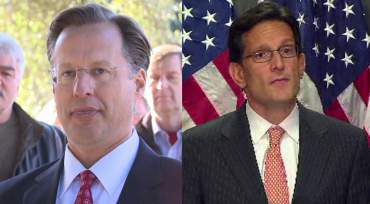 Brat spent a paltry sum of money when compared to Cantor. But his backing by the Right Wing talk radio circuit, the mouthpiece of Heritage/Cato, was tremendous free publicity. Somehow, Cato manages to appeal to the anti-crony capitalist Republicans rather deceptively. The Cato Institute is a group headed by a board of twelve, one being David Koch. Current Cato President Dave Allison used to head BB&T, the 9th largest financial holding company in the US with over $174 billion in assets. This is anything but a victory for populism. This is Heritage installing one of their Cato-funded professors trying to appeal to the average person, whose policies will “help” the average American in the worst possible way. This is Republican deception at its finest. I’m liking the comparison of Lincoln and our President, Barack Obama. I wonder where the two white supremacist militants who murdered two police officers and an innocent bystander were able to purchase their guns? Maybe they went to one of Las Vegas’ bi-monthly gun shows? In keeping with the recent tradition of a mass shooting weekly in America, Seattle Pacific University was the site of last week’s latest gun tragedy. How and when did it become so easy to obtain guns and ammo? Simply look back a few decades and it’s obvious what has aggrandized gun ownership: the re-branding of firearms as a hobby. There have always been fatal shootings in American history: most notably President McKinley, JFK, RFK and Martin Luther King; but they were not every day occurrences. So Congress tried to enact some sensibility with the Gun Control Act of 1968. …enacted prohibitions on the importation of firearms “with no sporting purpose.” Among the other major provisions of the GCA were the establishment of minimum ages for firearms purchasers, the requirement that all firearms (domestic and imported) be affixed with a serial number, and the expansion of the categories of prohibited persons. 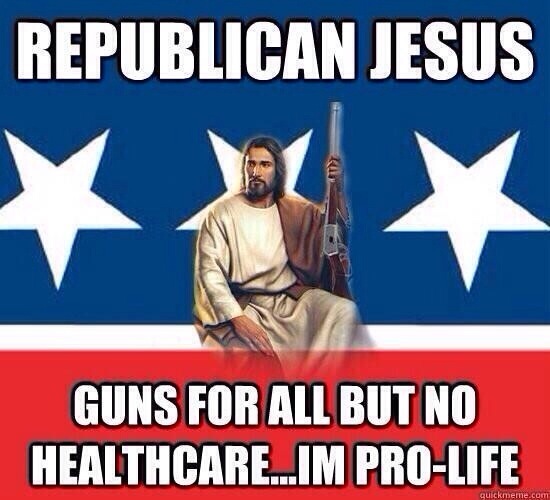 Is This Really How America Thinks? It prevents the government from creating a list of gun owners from dealer records. Allows ammunition shipments through the US Postal Service. Allows FFL (federal firearms license) holders to engage in business away from their normal business location. I.E. at a gun show. Eases the interstate sale of both rifles and handguns. 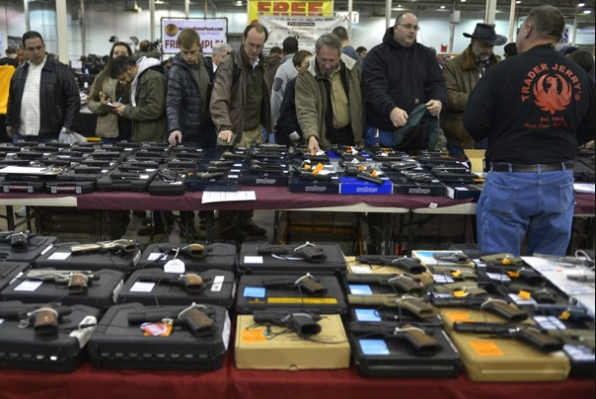 It eliminates the requirement that gun dealers notify police of handgun purchases and preempts state and local laws to ease interstate travel with handguns as well as rifles for any legal purpose. It eliminates the need for many gun sellers to obtain a license and keep records of their gun sales. Eliminates the record-keeping requirements for ammunition sales involving less than 1,000 rounds. How about we stop the madness by ending the gun shows that began during the Reagan Administration? Gun shows have turned possession of lethal weaponry into a ridiculously risky hobby, and I’m sure we can find better things to do with our spare time. Reaganomics, without a doubt, was the beginning of the end of the American middle class, where one patriarchal income could actually support an entire family. A decent factory job could enable a man to raise a family while the wife helped raise the children and groom them for an eventual college education. Women, though paid less, are now forced to work. The jump in working women has been especially prominent among those who are mothers — from 37 percent in 1968 to 65 percent in 2011. If men were always the sole breadwinners and now rely on women to help a family to simply survive, a seldom-discussed consequence of this is emasculation and resentment of women. Misogyny, known best by the label “Feminazis” (thanks Rush) has made many men turn to violence through guns, but not always against women. Guns are a substitute for the emasculation of their earning power. Right in the heyday of Morning In America, 1982, Senator Orrin Hatch teamed up with the NRA-ILA to make Americans reexamine the 2nd Amendment, which was almost as irrelevant as the Third (the government cannot force citizens to house soldiers in their homes). Hatch’s viewpoint was an insurrectionist interpretation, in which the Second Amendment is thought to allow for a militia of armed citizens to protect themselves against government, not the original framers’ intent of preventing uprisings against the government by the states. Slowly but surely, the conversion of the middle class to the working-poor took its toll on the masculine psyche. There is no question, Reaganomics commenced the hollowing-out of the middle class. The power and influence of the NRA, even after there was an assassination attempt on the Deity of the Republican party, Ronald Reagan, skyrocketed thanks to the Republican alignment with the gun industry. Gun ownership has always been fairly high for Americans, but the laws regarding gun-control legislation have become less and less popular. Because of insane contributions from the NRA-ILA, gun laws have been relaxed, even though most (78%) Americans are for stricter laws for the acquisition of guns. If you look at the history of mass shootings in America, coincidentally, the count begins in 1982. 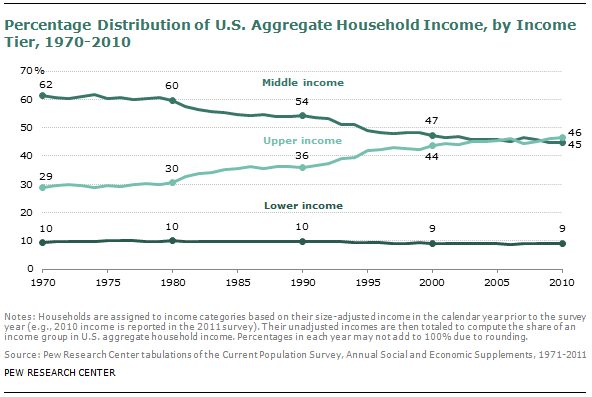 Does this irrefutably prove the decline of the middle class causes more gun violence? No, not entirely. But it certainly seems suspicious the reinterpretation of the Second Amendment coincided with the evisceration of the middle class that began under Reagan’s tenure. We all know President Bush vacationed excessively, spending 1,020 days of his presidency on vacation. In 2001, he spent the entire month of August at his ranch in Crawford, Texas. On August 6, 2001, Bush received a briefing from the CIA saying that Al Qaeda is interested in hijacking U.S. commercial airliners. “The system was blinking red. By late July it could not get any worse.” -(CIA Director George Tenet to the 9/11 Commission). With that knowledge, he takes one of the longest presidential vacations (August 3-September 3) with some knowledge of terrorist threats. He communicates minimally with NSA and CIA intelligence while away at Crawford and when he returns, he schedules a trip to Governor Jeb Bush’s state of Florida. Finding the agenda and “daily rundown” of Bush from Labor Day 2001-9/11 is not so easy. There is not much written on that time spent at the White House between September 3- September 9, 2001. I thought it’d be interesting to imagine President Obama in Bush’s position and venture a guess on how long impeachment hearings would commence after that awful Tuesday morning changed everything. Consider the relative safety of the state of Florida if he suspects something may go down on 9/11. No one outside the inner-sanctum of the Bush/Cheney intelligence community suspected anything was coming so no eyebrows would be raised by the publicity trip. On September, 10, 2001: At 6:30 p.m., President Bush arrives at the Colony Beach and Tennis Resort on Longboat Key, Florida. He is in Florida as part of a weeklong effort to place a national spotlight on education and reading, and visited a school in Jacksonville earlier in the day. In preparation for the president’s visit to the resort, all guests have been cleared out of the building “to make way for the invasion of White House staffers, aides, communications technicians—even an antiterrorism unit.” Overnight, snipers and surface-to-air missiles are located on the roof of the Colony and adjacent structures, to protect the president. “The Coast Guard and the Longboat Key Police Department manned boats that patrolled the surf in front of the resort all night. Security trucks with enough men and arms to stop a small army parked right on the beach. An Airborne Warning and Control System (AWACS) plane circled high overhead in the clear night sky.” (My emphasis in bold) Whether this is a typical level of security for a presidential visit, or is increased due to recent terror warnings, is unstated. 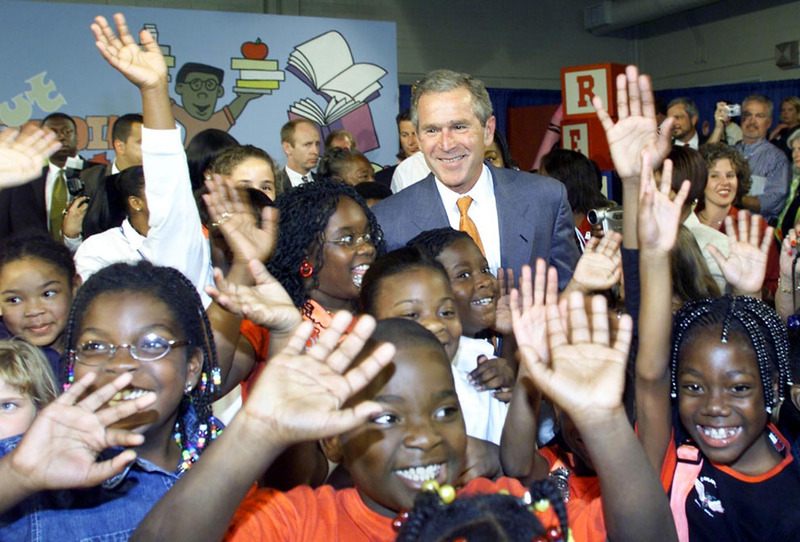 The next day, President Bush made an appearance at another school in Sarasota, Florida and we all unfortunately remember the book My Pet Goat forever. It’s should be outrageous, but we’ve never been given full access to the findings of the 9-11 Commission. I thought it was worth a look back in history to see how things have changed when it comes to the culpability and treatment of the President of the United States. Every vacation President Obama has taken has been mired in outrage and disgust from those on the right side of the aisle. The GOP-led commotion about four dead Americans in Benghazi and the subsequent, costly hearings that have ensued levies far greater criticism and blame on the Obama Administration than the Bush Administration EVER received for not keeping us safe from terrorists in 2001. The point is, no one ever called President Bush unpatriotic, traitorous or dishonorable. Never. Anyone who called him out on starting a war on false pretenses or advising the administration against occupying Iraq with too small a force (Shinseki) was censured and berated by the media and Bush/Cheney/Rumsfeld. No one could ever have imagined the inconsistent and hypocritical treatment of President Obama versus the unearned respect the Bush Administration received. It is just mind-numbing. It is just further proof the media is ANYTHING but liberal. The simple fact that a smear campaign has been launched against a POW before he has even been released from a military hospital proves that point absolutely. Now back to Bush; how many lives, how many trillions of dollars, were lost under his “watch,” for NO legitimate reason other than to make a few very select, inner-circle, rich fat-cats even richer? It embarrassed me, you, and most Americans: the world has laughed at the U.S. for many years now. By contrast, all of Obama’s logical policy decisions are criticized incessantly and still, he keeps trying and by some miracle, he…succeeds. This is why the Republicans can’t stand this president. He can do what they cannot: govern. 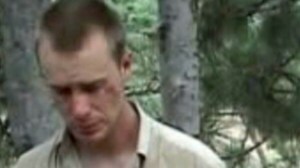 I’ve never heard disapproval when we have made deals to rescue Americans POWs, until Bowe Bergdahl was released. President Reagan did it on several occasions as part of the efforts to ensure the release of the Americans and others who were kidnapped in Lebanon back in the 1980s. In this case, Sgt. Bergdahl’s reportedly deteriorating health gave the president an emergency exception to a law he signed a year ago. There simply wasn’t time to deal with an obstreperous Congress who has never acquiesced to the requests of the Obama Administration. The nation of Israel is praised by Republicans and many Democrats as the ally who can literally do no wrong. Ironically, Israel has a long history of prisoner swaps, and the numbers have been far more lopsided than the exchange of one American for five detainees from Gitmo. After the Sinai War of 1956, Israel returned 5,500 Egyptian soldiers for four IDF POWs. On June 3, 1973, 3 Israeli Air Force pilots in Syrian captivity for three years were exchanged for 46 Syrian prisoners. In 2011, one Israeli POW was exchanged for over 1,ooo Palestinian detainees. Did the right accuse Israel of negotiating with terrorists? As far as anyone can remember they didn’t utter a peep about this. Those of us who never served in the military don’t realize how true the expression War is Hell really is. We have no concept of the horrors that come with serving in that hostile environment and the psychological havoc it wreaks on so many of our armed forces. Senator Ted Cruz, noted saboteur of government and enemy to veterans, is labeling Bergdahl a traitor who deserted his post, and subsequently caused the deaths of soldiers looking for him. Little is known yet about the circumstances surrounding the whole ordeal, but Cruz, who’s never served, has already tried and convicted this young man. Remember Jessica Lynch’s “dramatic rescue” from an Iraqi hospital where she was getting treatment in 2003? Where was the outrage from the media that so many people were simply IN Iraq searching for WMD that weren’t there? They gloss over the fact that over 4,000 Americans perished in a war based on lies. Lynch’s return warranted the Governor of West Virginia to declare a Jessica Lynch Day, but the Bergdahl’s son causes only disgust from our Republican friends for a man who went through unspeakable trauma . If Bowe Bergdahl would have died in captivity, then President Obama would be labeled a murderer. Instead he’s accused of illegally rescuing an alleged traitor. The GOP hates President Obama so much, they’ll smite POWs and Veterans just to prove it. In fact, I’m sure they’ll be criminal hearings in Congress over this matter. What else will the GOP House do, take care of our veterans? Fat chance. They’re too busy blaming President Obama because they won’t fund the VA. If this makes sense to you, you probably watch Fox News.